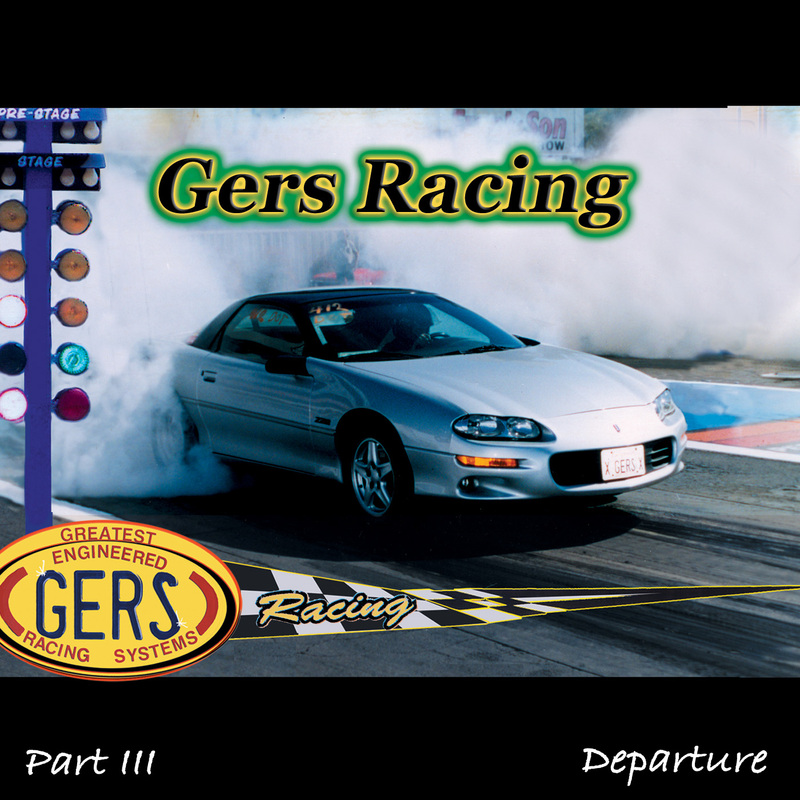 GERS RACING, PART III Departure - Available Now! 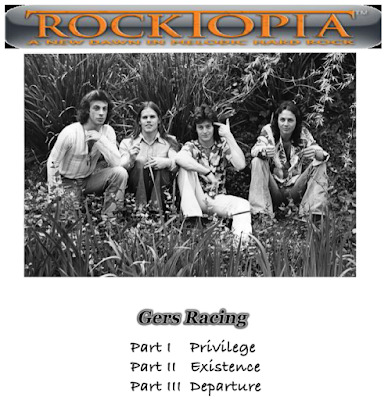 The trilogy is complete…’Part I Privilege’…Part II Existence’ and now ‘Part III Departure’ is another superb new masterpiece CD from vintage classic retro rockers GERS RACING who have worked in the past with the likes of Jimi Hendrix, Michael Jackson and Traffic. 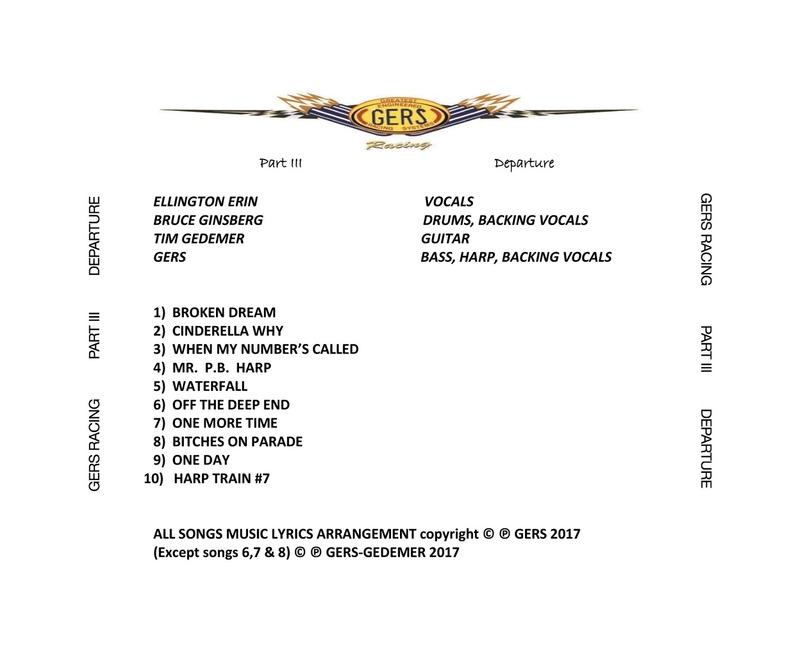 'Part III Departure’ is the hugely enjoyable new ten track album from classic rockers Gers Racing. This album has all the fundamentals of vintage classic rock albums that strikes the chord for its rich diversity, fun energy, passion and eccentric edge. 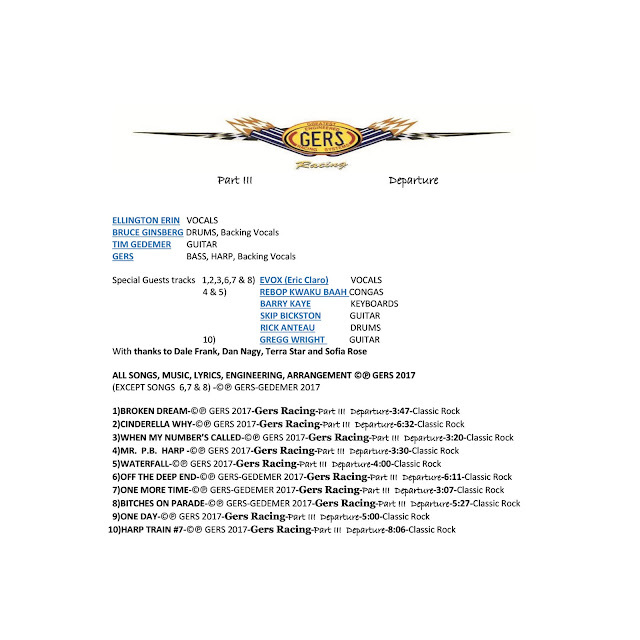 A lot of care and attention has gone into the creation of Gers Racing 'Part III Departure’. This record has all the hallmarks that fans of the genre will fully enjoy, but you need to live with the album for a while, soak the tracks up and get into the bands mindset, a quick listen won't reap the rewards and delights this album eventually offers. The band is: singer Ellington Erin, bassist and harpist Gers, lead guitarist Tim Gedemer and drummer Bruce Ginsberg, with special guests Evox (vocals), Rebop (congas) from Traffic and Gregg Wright (guitar) from Michael Jackson. Musically it's all here, there is something for everyone to enjoy throughout 'Part III Departure', we couldn't ask for more really and this is one of those albums you can play forever and get lost in. Watch out for Gers Racing, one to look out for in the future and a band who plays with feeling and style, and that’s a rare thing. 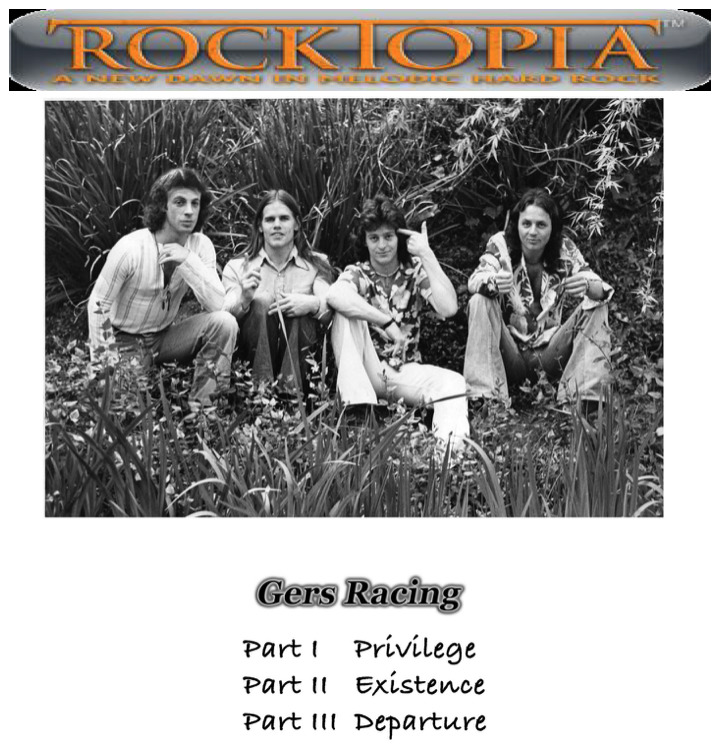 ‘Part III Departure’ is the new album from classic rockers GERS RACING. Vintage classic rock, think Hendrix, Ozzy, Dio and Deep Purple. ‘Part III Departure’ has exploded onto the scene. GERS RACING ‘Part III Departure’ is such a masterpiece with great vocals and music. The ‘departure’ is the action of leaving, typically to start a journey. And it is a deviation from the norm; course of action or thought. A paradigm shift…thinking outside the box. 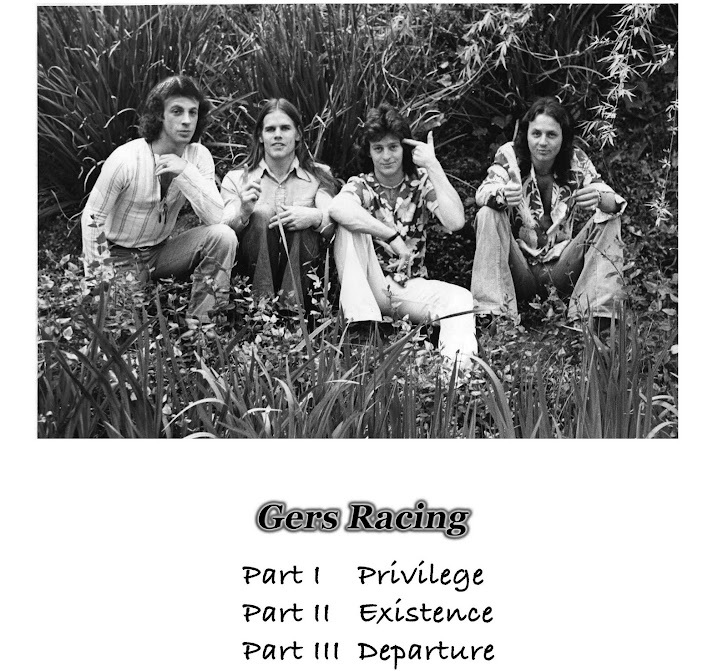 GERS RACING ‘Part III Departure’ will give you the coordinates for your departure and give one’s life a definite direction. So every day live life to the fullest and live the life of a warrior; living right, eating right with a strong mind and a strong body. And not let one day get away. It will lead you from unreal to real, from darkness to light, and from death to immortality. 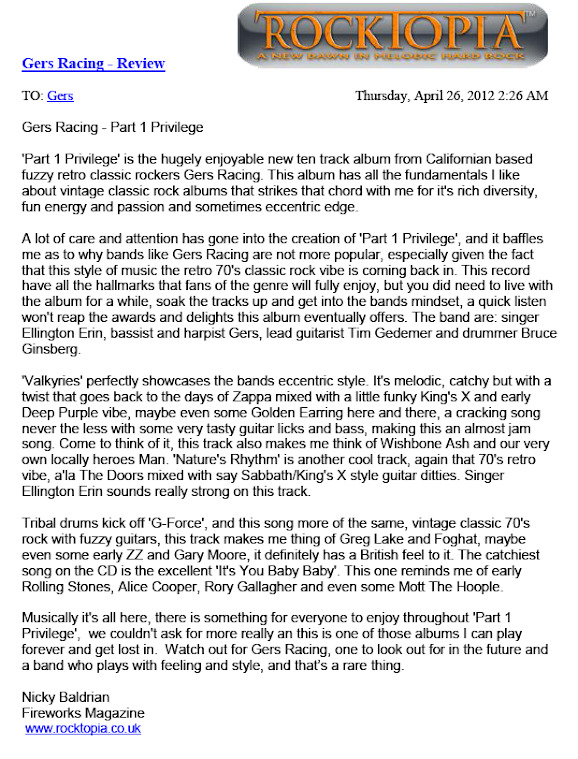 Rocktopia CD review from issue #56.